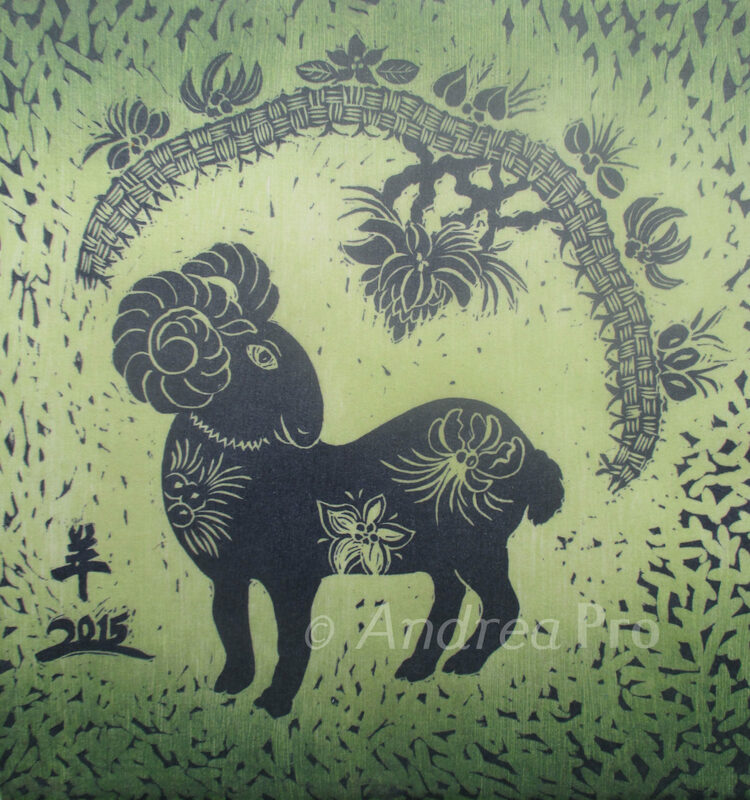 In Chinese astrology the sheep symbolizes compassion, harmony and appreciation of beauty and the arts. The sheep of 2015 is governed by the element of wood, which highlights a desire to nurture and understand oneself and others. In this image the sheep is surrounded by a barbed wire fence with Hawaii native plants on either side. Note the ‘Ohi’a, Koa, Sandalwood, and Wili Wili flowers and seeds. The flowers of these trees adorn the sheep in the artistic style of depicting Chinese astrology animals,	My own Chinese astrology sign is the wood sheep. It’s been great fun to explore my favorite themes of mythology, Hawaii native species and the human psyche while researching and creating this image. This is a linoleum cut print with a color wood block for the background. Printed on Hosho Japanese paper with deckle edges.